The Germany Nebelwerfer family. They were known by the recipients of their wares as “Moaning Minnies” or “Screaming Mimi”, because of the frightful sound given by the projectiles in flight. These weapons were called “Nebelwerfer”, or “Smoke Mortar”, not just because they were able to fire smoke ammunition, but also to mask their development started in the late 1920s when the German military was still under the arms limitations imposed by the Versailles Treaty. The Nebelwerfers, unlike the Soviet Katyusha, did not use a finned rocket. The design instead used a barrel with rifling grooves to give a spin the projectiles. The most commonly known Nebelwerfer is the six barreled Model 1941, or 15cm. model. It was introduced into service in 1941 and tossed a 70 lbs. HE projectile to a range of over 4 miles. It was mounted on the modified carriage of a Pak 36 ATG. The Nebelwerfer Model 1942 was a five barreled version with 210cm barrels, and capable of launching HE shells weighing almost 250 lbs. up to 4.8 miles. It has a carriage similar to the 15cm model, but had the wheels offset, and thus allowing the carriage to be lowered. Both were fired in series, electrically, from a distance, due to the substantial back blast of the massive projectiles. The Nebelwerfer 15 cm is considered a multi-launcher in Bolt Action much like the Land Mattress or the Katyusha. It strikes as a “Heavy Mortar” – 3” template, with the normal rules for a multiple launcher. The model 1941, 15cm model. Yes, the crew are Russian. I am an outlier and do not have a German army, or even a figure in my collection. I also built the Nebelwerfer 21 cm, well, just because. It doesn’t currently have a listing in Bolt Action, but there are new campaign and theatre books being released all the time. With a 248 lbs. HE shell, it probably should be considered similar to a Heavy Howitzer! 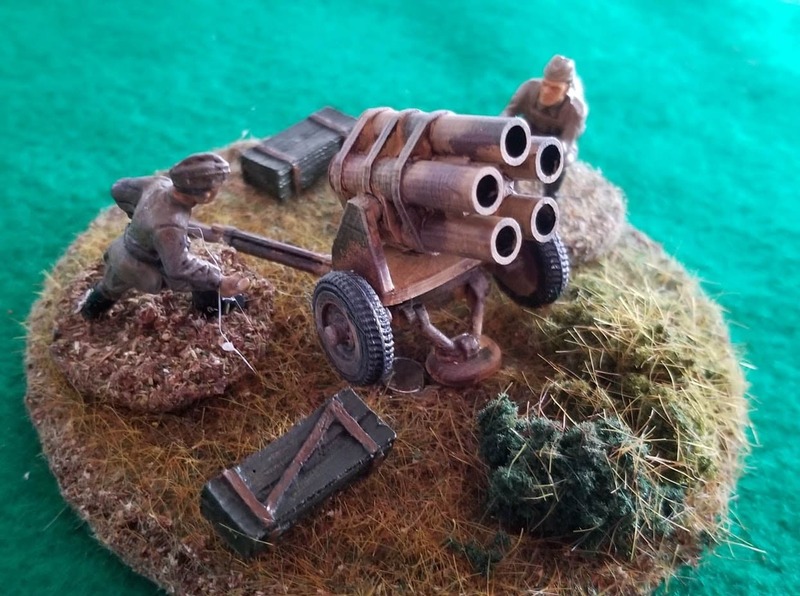 The Nebelwerfer is available to only to the Germans in Bolt Action, but that seems to cover 90% of the people I know who play the game, so hopefully this file will be of use. These are original files, created from scratch. There are two files for each of the two model; one each for the carriage and the barrel assembly. Each is specific to the model – the 15cm and the 21 cm model. Please not the location of the tow hook (left trail when standing behind the gun). Please print with supports, on “fine” – 0.1mm layer – settings. As always, test fit and be careful removing support material. The model’s .stl is available at Wargaming3d.com’s marketplace.